In previous posts, we’ve discussed two of the best-known Shoujo manga magazines, Ribon and Nakayoshi. So many popular manga series have come from these two magazines, it’s almost certain that any western manga fan will have at least seen their names. But, of the three most popular girls’ manga magazines, these are #2 and #3. The best-selling girls’ manga magazine in Japan is Ciao (ちゃお). How much more popular? 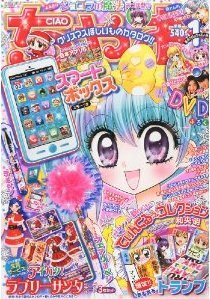 According to the Japanese Magazine Publisher’s Association data for 2011-2012, where Ribon sells about 225K copies a month and Nakayoshi about 171K/month, Ciao sells 620,000 copies a month. In a market that shrinks a little bit with every passing year and better technology, this is a significant number of young girls reading actual print copies of a manga magazine. While most of the Ciao titles familiar to a western fan are those that we might consider “for children”—Pocket Monsters (Pokemon,) Hamtaro and some of the Di Gi Charat series—at least one series that developed an older following, the Chiho Saito and Be-Papas collaboration Revolutionary Girl Utena, ran in Ciao. Based on my Twitter feed of manga artists and fans the number one series running in Ciao right now is Aikatsu!, the manga for a popular anime/collectable card game/video game franchise about girls in a idol academy. At 540 yen per issue, ($5.23 at time of writing) for about the same number of pages, Ciao is a good buy. Ciao Land, the website for the magazine, is filled with colorful shininess and a number of tools that create audience engagement without breaking barriers between creators and readers. Reader diaries and messages from authors let each feel connected to the other. Like Ribon and Nakayoshi, Ciao‘s print edition comes bundled with toys such as accessories, writing sets, and phone and calendar stickers. While any given issue of Ciao will be filled with typically passive shoujo manga female protagonists waiting for romance, from time to time, Ciao escapes from the shoujo manga stereotype. And when it does, as in Utena, Bloody Lily or Waza-ari Kiwami-chan, the result is not at all what you might expect. Ciao heroines have the potential do amazing things.